This beautiful dress pictured above on Emma Watson was made out of recycled plastic bottles. 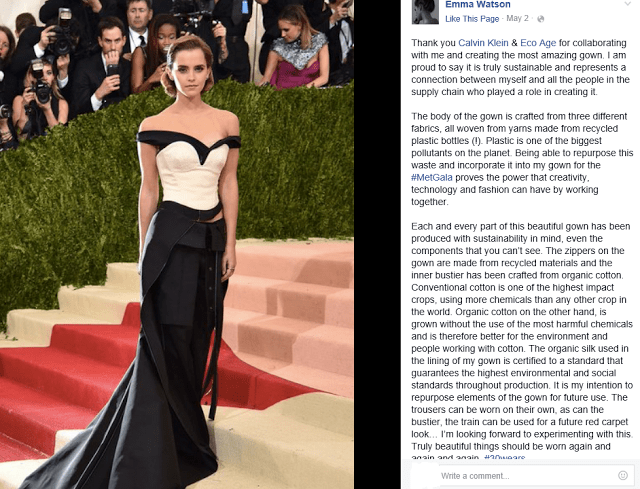 Emma Watson made a statement on the Met Gala red carpet on Monday night by participating in the Green Carpet Challenge, and on Instagram, her stylist, Sarah Slutsky, explained that the five piece look created by Calvin Klein with some contributions from Watson herself and Eco-Age, a company that helps businesses introduce sustainable solutions. The dress she wore was a black and white gown made completely out of recycled materials. The gown was made of re-purposed plastic bottles to keep with the “Manus x Machina: Fashion in an Age of Technology” theme. The body of the gown was made using three fabrics, all woven out of yarns made from recycled plastic bottles. Even the smallest details, like the zippers, were made from recycled materials and the linings were made of organically grown and crafted cotton and silk.